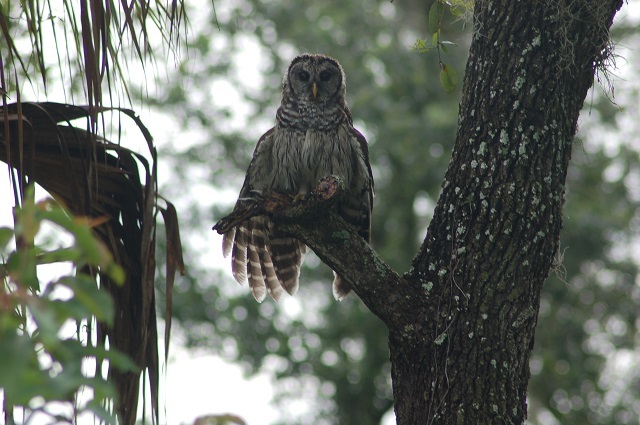 Located in the Polk Uplands of northern Hardee County, this state park preserves 10 natural communities along the Peace River as well as historic sites pertaining to the Third Seminole War. Five nature trail loops guide visitors through scrub, pine flatwoods, xeric hammock, bottomland forest and bay swamp habitats; a trail along the river connects trail loops on the eastern and western sides of the park. The trails nearest the river and the ecotones between habitats are particularly good for migratory songbirds in fall (including Northern Waterthrush, Tennessee Warbler, Scarlet Tanager and Painted Bunting). Take the canopy-level bridge south across Paynes Creek or veer north to the “catwalk” which runs through bottomland hardwood forest. When encountering wintering feeding flocks watch and listen carefully for Black-and-white Warbler, Yellow-throated Warbler and Blue-headed Vireo.